This pattern is perfect for both kids and adults, as it prevents having to tie knots and long ends that can get stuck on ski lifts or trees when sledding. Put this on under your jacket and you have both warmth and safety. All patterns and images © Alison Hanseland are shared here for individual personal use only. 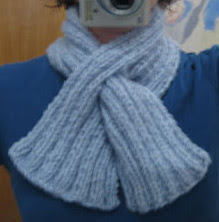 Instructions:Cast on 38 st. (26 stitches with bulky yarn).